Turkey's first drillship, Fatih, started drilling deap-sea well late October in the Mediterranean, and the country is now prepared to send a second drillship to regional waters in late February. Turkey's second drillship will make its way into the country's territorial waters in the Mediterranean around Feb. 20 to begin exploration. Energy and Natural Resources Minister Fatih Dönmez announced on Friday during an interview on broadcaster TRT Haber that Turkey's state-run petroleum and gas exploration and drilling company Turkish Petroleum would continue seismic exploration in its licensed zones in the Mediterranean. "As you know, we started our deep drilling in October 2018. I think we will get the first result at the beginning of next month or at the end of this month. 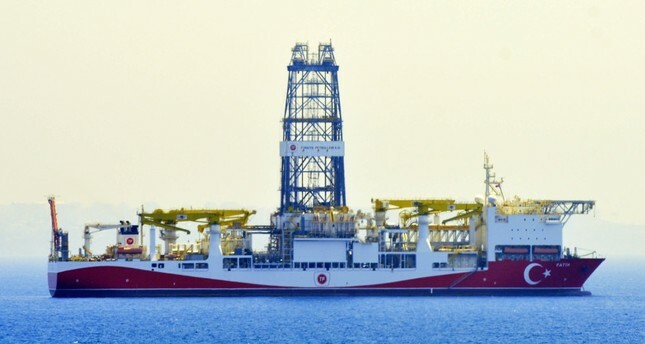 Of course, it's too early to say anything," Energy and Natural Resources Minister Dönmez explained.Turkey will continue exploration by drilling four times per year, two done with the existing Fatih drillship and two with a new vessel expected to arrive on Feb. 20. He confirmed that Turkish Petroleum drilled 70 wells last year, while the private sector drilled around 40 wells, adding that this would increase in 2019 to 130 and 50, respectively. However, he indicated that following seismic surveys conducted by the two seismic vessels in the Black Sea and the Mediterranean, Turkey made a small gas discovery in the Thrace region, which he said he would detail further on Monday, Feb. 11. Barbaros Hayrettin Paşa, Turkey's first seismic vessel, was bought from Norway in 2013 and has been conducting surveys in the Mediterranean since April 2017. Turkey started its first deep-sea drilling offshore near Antalya on the Mediterranean coast on Oct. 30. Drilling operations that started on Nov. 26 in the shallow waters off Mersin [in southern Turkey] are also ongoing. He also asserted that Turkey would not give consent to the fait accompli in the area in which the Greek Cypriot's have undertaken unilateral exploration around the island of Cyprus. "We say that it is unlawful for Greek Cyprus to tender oil or natural gas exploration in areas that it claims to be its own," he said. On Oct. 18, the Turkish Navy blocked a Greek frigate trying to interfere with the Barbaros Hayreddin Paşa seismic survey vessel. The incident prompted an immediate response from Turkish officials, who warned Greece against actions in the Mediterranean that could spark tensions in the region. Turkey has repeatedly warned against any unilateral exploration activities by international energy companies commissioned by the Greek Cypriot administration, disregarding the rights of Turkey and the Turkish Republic of Northern Cyprus (TRNC). Italian, French and American energy giants have so far engaged in hydrocarbon exploration and well-drilling operations in the region, specifically in the Exclusive Economic Zone (EEZ) unilaterally declared by the Greek Cypriot administration and consisting of 13 blocks. Turkey does not recognize the Greek Cypriot administration's EEZ as it violates the sovereign rights of the Turkish people and Turkish Cypriots living on the northern part of the divided island. Some of the blocks in the unilaterally declared EEZ fall within the Turkish continental shelf and Turkish Cypriot territorial waters. According to the international maritime law of the U.N. Convention on the Law of the Sea (UNCLOS), national territories have a continental shelf up to 200 miles, while islands have territorial waters extending up to 14 miles. For instance, the putative 4th, 5th, 6th and 7th Blocks fall within the limits of Turkey's 200-mile continental shelf. Meanwhile, Turkey is not a signatory of UNCLOS. After gas discoveries sped up in the region over the last decade, regional countries have concluded bilateral maritime border demarcation agreements with the Greek Cypriot administration. For example, in 2010, Israel hammered out an accord demarcating maritime borders with Cyprus. The deal had naval security implications and set an official separation of hydrocarbon reserves claimed by Israel and Greek Cypriots who had already done the same with Egypt and Lebanon in 2003 and 2007, respectively.